Ever since I crafted some leather bows for my hair, I have been on the look out for other fun & fabulous hair accessories... and I haven't had to look far. While during the summer all I wanted to do was keep my hair off my neck, so the "blogger bun" became my go-to style, this season I am looking to pick up some baubles to wear my hair with more variety. What is your fall hair style routine? Do you pin it up? Glam it up? Cover it up? Or just leave it be? love the bows! so fun! Super cute picks! Loving #11. Definitely want to buy some cute clips to put in my hair for fall! When it finally cools down! I love bows, too! I always try to keep them from becoming overly-girly, but it doesn't always work. Cant live without those hair ties! 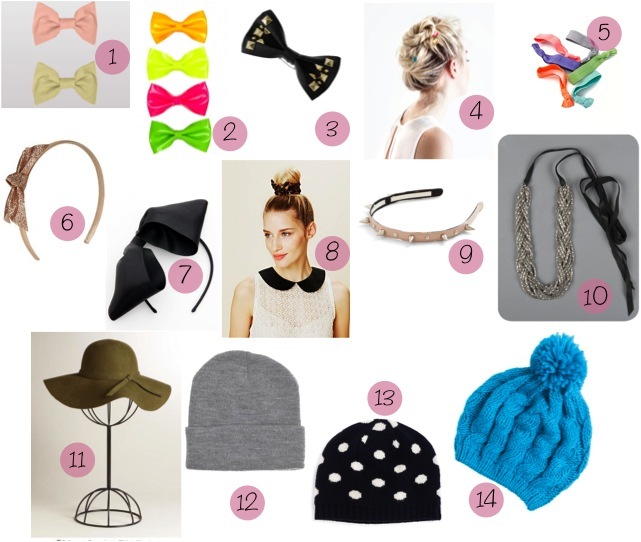 All these bows are so cute but I am attached to number 10!! Love it!!! I have a piece really similar to #10 and I LOVE it! I definitely should do more with my hair. I normally just have it in a ponytail unless something special is happening.